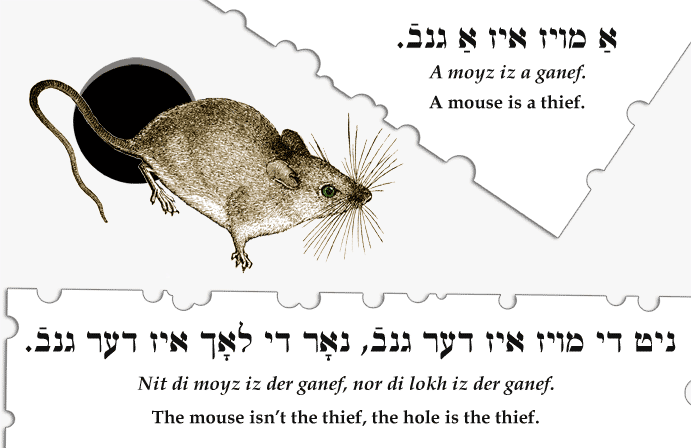 Yiddish Wit: A mouse is a thief. / The mouse isn't the thief, the hole is the thief. ניט די מויז איז דער גנבֿ, נאָר די לאָך איז דער גנבֿ. אַ מויז איז אַ גנבֿ. A moyz iz a ganef. Nit di moyz iz der ganef, nor di lokh iz der ganef. A mouse is a thief. The mouse isn't the thief, the hole is the thief.